One fuzzy circle surrounded by soft petals can take your breath away. Imagine a 250-acre sprawl of flowers. 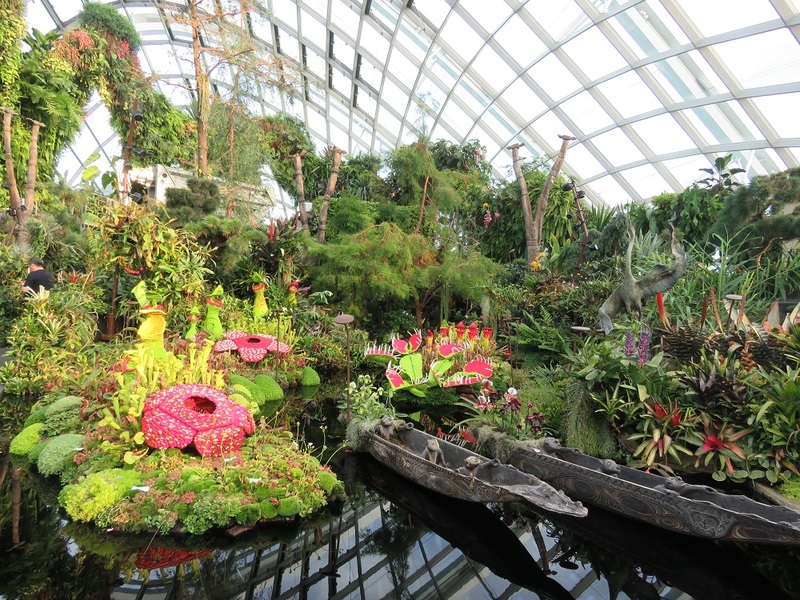 I was lost in a fragrant paradise, except that it was right on earth – Gardens by the Bay in Singapore. One day is not enough to feast your eyes on the vibrant floral carpet that seems to sprawl into infinity. Here, flowers gather in astoundingly beautiful forms. 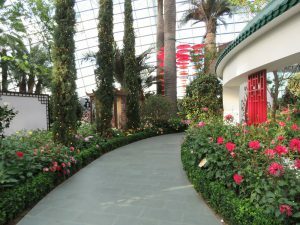 One of them is the floral dome that paints the greenhouse in mesmerizing hues. 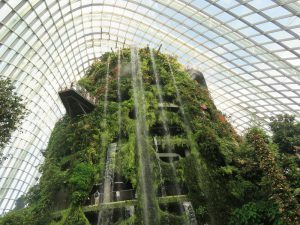 Did I mention that it is the world’s largest glass greenhouse? “I was surprised to spot ladies’ ear drops. 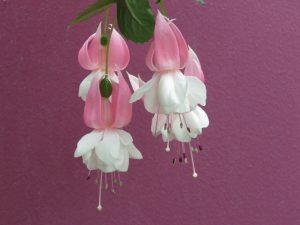 Then I realized that Mother Nature had opened up her jewel box – these ear drops’ are uniquely shaped fuchsia flowers. The name of this colour is derived from the flower’s name”. I also saw colourful inverted bulbs standing on stalks. Surprisingly they had ‘lips’ in their name. 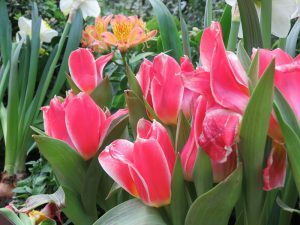 Of course, I am talking about tulips. Then I spotted gorgeous flowers with concentric circles of petals in varying shades of pink. 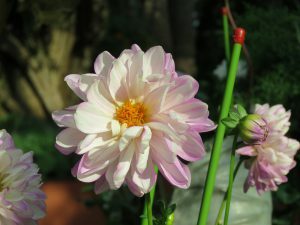 I rediscovered the Dahlia, all over again. There was also a generous sprinkling of prose-inspiring roses. I wandered out of the greenhouse and into the rainforest. Yes, you read that right! It was a lush rainforest nestled in a garden. There was a 35-metre waterfall draped in a skirt of gushing water decorated with ferns and orchids. Flaming crimson flamingo flowers were dancing around. This is also known as the Anthurium flower. The vibrant colour palette was made complete by purple orchids and yellow butterflies. Surprisingly, these butterflies wear petals with wine-coloured spots. These flowers are also known as Oncostele Wildcats. Insects drink from some flowers but there are petal-wearing carnivores that insects wouldn’t dare to touch. 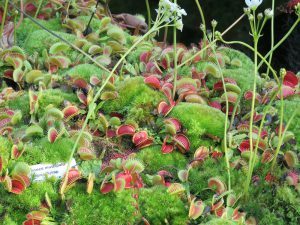 The Venus Flytrap looked like a bunch of long-toothed mouths ready to swallow adventurous insects. 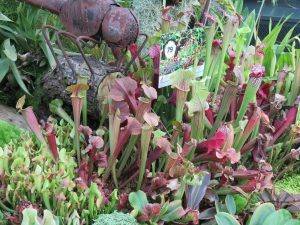 The Pitcher plant looked like a tube waiting for a curious insect to take a peek. That would be the most dangerous peek ever. This was a little overwhelming for me. I turned my attention to a pink pineapple. Then, I did a double take. It was a blushing ginger lily. Sometimes, the Creator enjoys surprising us. Speaking of surprises, I spotted a lady’s slipper. For a moment, I looked around for Cinderella. 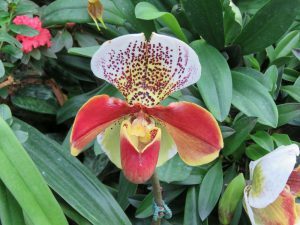 Then I realized that the slipper was, in fact, an orchid”. Then I chanced upon the most amazing sight. Giant trees rose all around me. There was something incredibly unique about these trees. Their roots seemed to stick in the air. I found that they were not made of wood but solar photovoltaic cells to harvest energy from the sun. 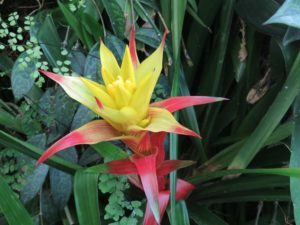 The trees were covered by over 200 varieties of bromeliads, orchids and ferns and tropical flowering climbers. It was a stunning example of vertical gardening. At night, the trees glowed like giant optic-fibre torches. A 22-metre high OCBC Skyway gracefully curved between two of the Super Trees. It was an irresistible invitation to enjoy a view of the garden from the top of a tree. 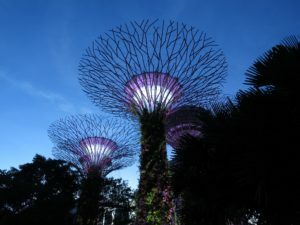 I didn’t have the heart to leave Gardens by the Bay, so I stayed back for one last spectacle – the Garden Rhapsody show. There are two shows, one at 7.45pm and the second at 8.45pm. The light show is free – no tickets are required. I finally ticked Gardens by the Bay off my bucket list. It should be on yours, if it isn’t already. 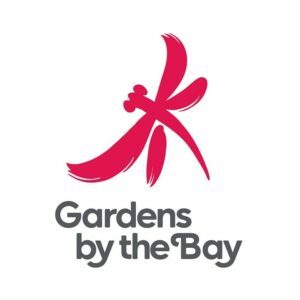 You can make an online booking for this once-in-a-lifetime experience at www.gardensbythebay.com.sg or www.visitsingapore.com and enjoy good deals. Look forward to a great deal of fun! Wonderful portraits and Mesmerising tag lines !!! Curiously looking forward for the next upcomings !!! Thank you so much, sure will post more and interesting nature photo stories in the near future. Thanks for your concern. Currently, we are in a complete revamp. Once we done it, will let you know. Thanks for the feedback, will let you know shortly. Anything is possible under the blue sky. Please send your area of interest. We will try to come-up with the concept for your blogging. Sure, will come-up with more creative contents like this. I’m inspired! Extremely useful information specifically the ultimate phase 🙂 I care for such information much. Your words are more encouraging than anything in the world. Thank you, its my pleasure. Thanks and advanced wish for your successful mission. on Facebook? Keep up the excellent work! Please post it in the facebook. Hiya very nice site!! Guy .. Excellent .. Superb .. I will bookmark your site and take the feeds additionally…I’m satisfied to search out a lot of helpful information here within the publish, we want develop extra strategies in this regard, thanks for sharing. Sure, will post more trail stories. in the post, we want work out more techniques on this regard, thank you for sharing. I must say you have done a amazing job with this. Additionally, the blog loads super quick for me on Safari.